Polly’s Planting & Plucking, Inc. began in 1983 with Stafford ‘s Pier Restaurant as the first client. 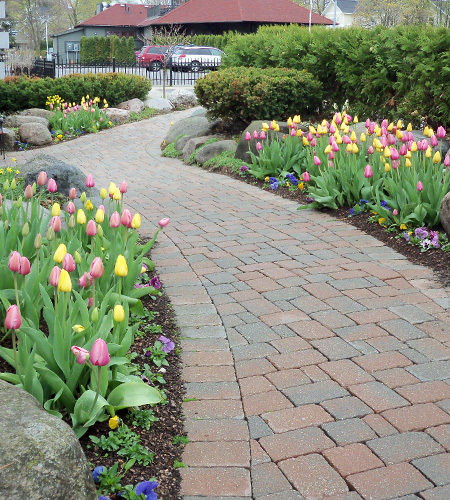 Polly Hudson-Cummings started designing and planting annual gardens, boxes and pots in Harbor Springs. Working out of her station wagon with a wicker basket of small tools, she quickly became busy enough to take on help. Kim Buntin came on board in 1984. The business was still run from the ‘Kitchen Table’ until we moved to an old gas station on State road. After a short couple of seasons, we needed more space; the fleet was increasing, along with the staff, to keep pace with growth. We moved to rental space in Franklin Park . During this period we still purchased the bulk of our plants from local nurseries. Kim acted as general manager of maintenance, scheduling and staff training. In 1994 Kim took a leave of absence for two years to raise her young children. By 1996 Polly had purchased our current property and built our office but decided to retire. She turned to Kim with an offer to take on the business as owner. Kim and Bob Buntin purchased Polly’s in July of 1997. The growth of the business, which has always been brisk, has continued to accelerate. The area has seen tremendous growth and we have expanded to meet the demand and potentials availed to us. We now purchase all of our products wholesale or we grow it ourselves. In 2001, following the closures of several local nurseries, we decided to fill that void and open for Retail! This new division is one of our most exciting ventures to date. We continue to strive for excellence in all aspects of activity at Polly’s.design, products and service. We are proud of the efforts that have brought us to this place and want to thank everyone who has had a part in it.